I love that it has become trendy for even the most upscale restaurants to offer mac and cheese on the menu. And I love that we have more ‘gourmet’ burger joints in our town than we do gas stations. And I extra love that the gastro-pub we dropped into yesterday for lunch had ‘Grandma’s Green Bean Casserole’ as a special. I am thrilled that all of the delicious, nostalgic, homey foods from my childhood are being reinvented, and enjoyed all over again. Chefs seem to have tackled and upgraded everything from tater tots to oatmeal cookies. But you know what has been totally overlooked in this comfort food overhaul? Sloppy Joes. Is there any dish that screams ‘Kid Food’ more than the humble Sloppy Joe? I’ll admit that not all sloppy joe memories are happy ones. The soggy school-lunch sloppy joes were fodder for elementary school nightmares. But sloppy joes CAN be delicious. I recall a fantastic summer camp sloppy joe served on a perfectly crusty pretzel bun. And another, spicier version that a neighbor’s mom made with leftover chili. The thing about sloppy joes is that there are no rules. Anything goes. Which is why they are ripe for reinvention. A little bit messy, a little bit sticky, these Maple Dijon Sloppy Joes are all the sloppy joe was meant to be. Sweet, tangy, hearty and full of flavor, this is kid food that I love even more as a grown up. I’m a big fan of maple syrup in savory dishes. With the ground beef here, it provides just enough sweetness and plenty of rich flavor. Be sure to use good quality maple syrup (the real stuff!) and good Dijon mustard too. This recipe makes plenty for four big sandwiches, but if you have leftovers, they actually freeze well. 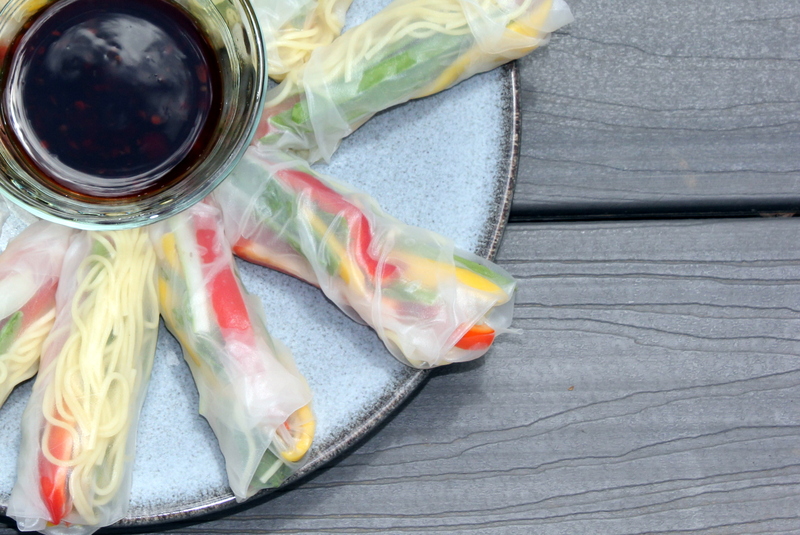 Or, you could get creative and reheat leftovers with a bit of hoisin sauce, a dash of soy sauce and some chopped water chestnuts and serve in lettuce wraps for a whole new Asian-inspired meal. In a large skillet, heat the oil over medium heat. Add the carrots, celery and pepper and sauté until the veggies are soft, about 10 minutes. Add the garlic and ground beef, and cook, breaking up with a spoon, until no pink remains (if the meat starts to stick, add a few tablespoons of water). Reduce the heat to medium-low. Add the ketchup, Worcestershire, paprika, mustard, and maple syrup. Stir well and simmer about 10 minutes. Add salt to taste. 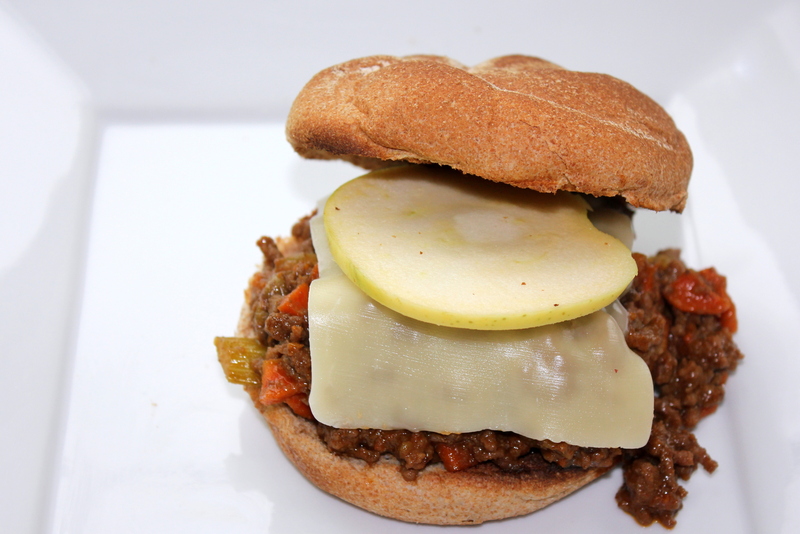 To serve, spoon the sloppy joe mixture into the buns and top each with a slice of cheese and a slice of apple. Pass around plenty of napkins! Check out http://www.purecanadamaple.com for more information on pure maple syrup and Think Outside The Griddle recipes. I love my CSA farm share. I could tell you that it’s because the veggies are bountiful and fresh, or because our farmers are lovely and inspiring. But the truth is, it’s mostly because I enjoy the challenge. Anyone who has been part of a CSA knows that feeling of excitement every week when you arrive to pick up your share, wondering what will end up in your bag. I adore the not knowing, the surprise of finding a big purple eggplant or a bunch of fresh herbs or a pile of carrots. But then I get home an I realize that I never used up all those carrots from last week, or even the week before, and now my crisper is overflowing with carrots. And dill. I like dill well enough, but what’s a girl to do with three bunches of fresh dill? The answer, of course, is to throw it in everything. So we’ve been having roasted carrots with dill, and salads with a dilly vinaigrette, and carrot soup with a dill oil drizzle. And this morning when I wanted eggs it seemed only natural to add in my staple ingredients of the moment. 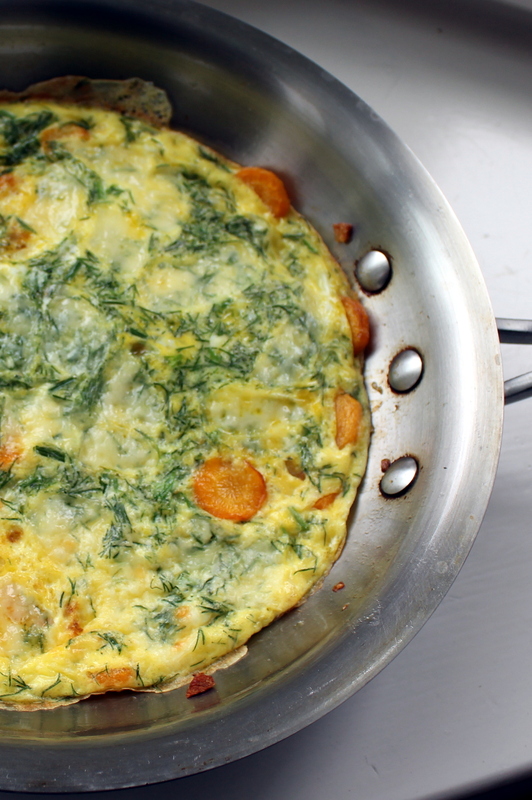 Surprisingly, carrots and dill and a bit of Swiss cheese make for a truly delicious frittata. The sweet carrots, fragrant dill, and nutty cheese bring the humble egg to a whole new level. I think the trick, though, is not to overcook the carrots. You do want them soft – but not mushy. The bit of bite they lend to the frittata makes it seem heartier, more substantial. I’ve pretty much worked my way through my stash of carrots, and I only have a small bunch of fresh dill left. We’ll see what next week brings. I’m hoping it’s not more garlic. I have nine heads of fresh garlic in my fridge right now. Anyone have any great garlic ideas? Preheat the oven to 400 degrees. In an oven-proof 8-inch skillet, melt the oil and butter over medium heat. Add the garlic and carrots and sauté until the carrots begin to soften, about 6-7 minutes. Meanwhile, in a medium bowl, beat the eggs, milk, dill, salt, an pepper until frothy. Reduce the heat to low and make sure that the carrots are spread evenly in the pan. Then slowly pour in the egg mixture. Shake the pan a bit to distribute the egg. Allow the frittata to cook for 2-3 minutes to let the bottom set. Sprinkle the cheese over the top and transfer to the top rack of the oven. Cook until the egg is set and golden and the cheese has melted. 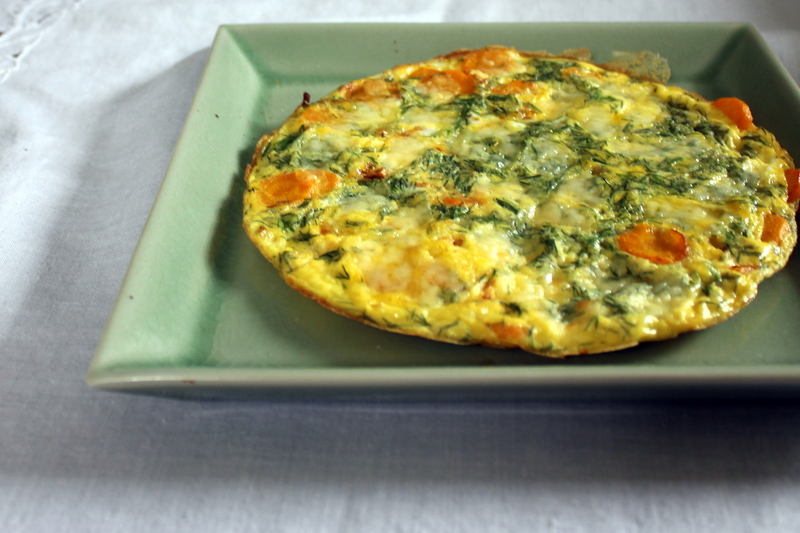 Run a spatula around the edge of the pan and turn the frittata out onto a plate. Slice and enjoy (also yummy cold)! In my family, Chuck’s macaroni and cheese is iconic. Does your family have dishes like this? Dishes that are requested by the guest of honor at birthdays and dreamed about by family members away from home for too long. Over the years we have bullied Chuck into making his mac and cheese so often that, out of boredom, his recipe has morphed. Chuck cooks kind of like I do – which is to say that he chafes at strict recipes, loves to improvise, and can rarely manage to reproduce an exact replica of any dish. So now, when Chuck makes his mac and cheese, there is always a twist. Sometimes there’s bacon, sometimes chunks of pickled garlic. Whatever inspires Chuck ends up in the mac and cheese. When we had friends over for dinner last weekend, it occurred to me that it would be awfully fun to let each one of us tinker with our own, individual bowl of Chuck’s mac and cheese. I made up a big pot of cheese sauce, and we each tossed the bubbling cheese with pasta and any other mix-ins we desired before throwing it in the oven to bake and crisp. Jeff, of course, dove right into the crumbled bacon and diced Italian sausage. I was a big fan of the steamed cauliflower and fresh herbs. Basically, anything goes here, so the toppings below are just suggestions. And as for the cheese sauce, feel free to adjust that to your tastes as well. Chuck sometimes mixes up the cheeses he includes, or throws a can of diced tomatoes directly into the cheese itself. But don’t skimp on the mustard powder – it’s Chuck’s (not so) secret ingredient. Cook the pasta in plenty of salted boiling water until just al dente. Meanwhile, in a large pot, melt the butter. Sauté the onion and garlic in butter over medium heat until soft. Add in the flour and reduce the heat to medium-low. Stir in the salt, pepper, and mustard powder, and cook the flour mixture 5 minutes. Slowly add just a splash of milk, and wisk until a smooth paste forms. Add half of the remaining milk in a slow stream, wisking constantly. Wisk in the remaining milk and cook until slightly thickened, about 3 minutes more. 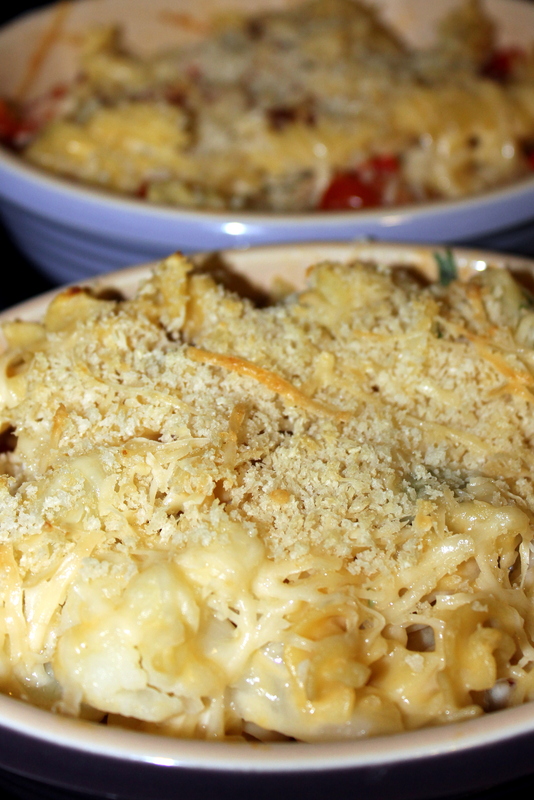 Add in the cheeses and stir continually until the cheese is fully melted. Add additional salt and/or pepper to taste. Keep the cheese sauce warm over low heat while you assemble the mac and cheese. Preheat the oven to 350 degrees. Grease 8 oven proof bowls or ramekins. 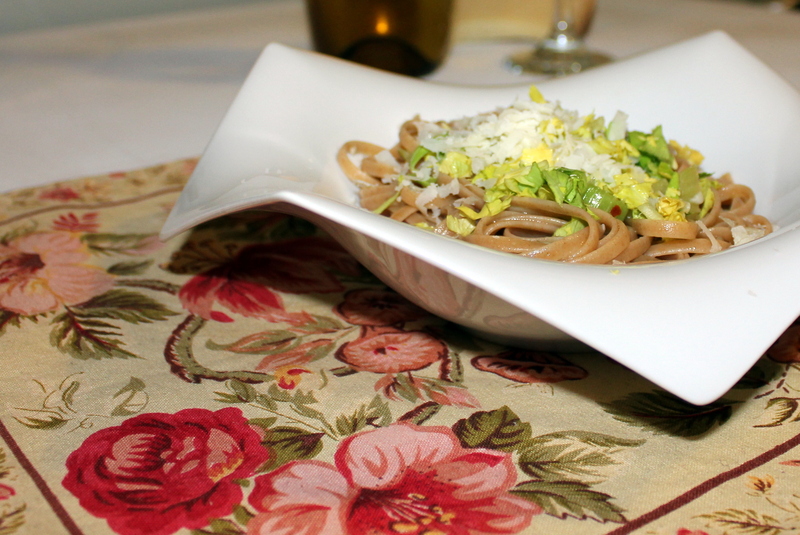 Give each guest his or her bowl to fill with pasta, cheese sauce, and any variety of mix-ins. I suggest topping with parmesan cheese and bread crumbs. Arrange the bowls on two jelly roll pans and bake until the tops start to brown and the cheese sauce is bubbling. I think rice pudding is one of those divisive foods. Some people love it, some people hate it. When I was a kid, every time we went to New York City my mother would take us to her favorite deli. We’d slurp bowls of matzo ball soup, share overstuffed pastrami sandwiches, and then tuck into a creamy bowl of rice pudding. Wolff’s Deli’s rice pudding was cool and sweet, laced with plenty of cinnamon and a generous helping of raisins. Wolff’s served their rice pudding with a swirl of whipped cream on top, but Mom and I would skip the cream, digging down deep in search of plump raisins. My brother would wrinkle his nose and shake his head and pat his pastrami-filled belly. I don’t know if he ever actually tried that rice pudding, but he insisted that he hated it. Jeff hates it too. But that didn’t stop me from turning a take-out container of leftover brown rice into a sweet, exotic treat. 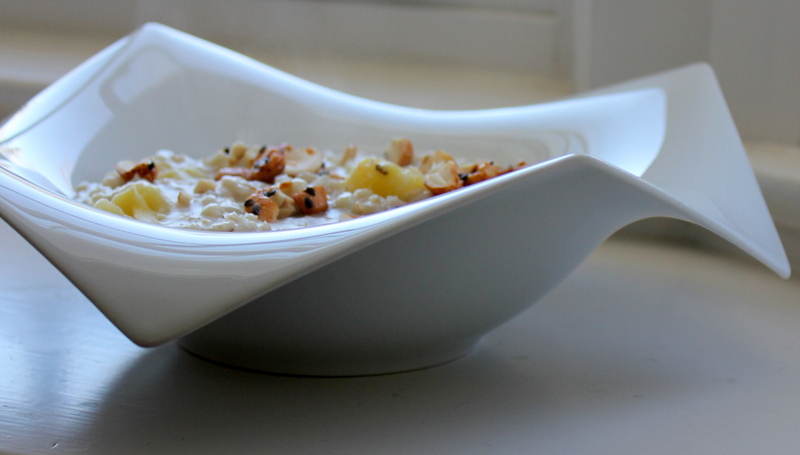 I love cool, cinnamon-scented deli rice pudding. But this week, I wanted something a bit more tropical. Ok, that’s actually not true. The truth is that I just didn’t have any raisins. And along with that leftover rice, I had half a can of coconut milk languishing in my fridge. Basically, my cupboards were almost bare and I was hungry. So pina colada rice pudding was born. I actually ate this rice pudding warm for breakfast. But I think that it would be lovely either warm or cold, for breakfast or dessert. I had some fancy flavored roasted cashews lying around too, so I sprinkled those on top. I think any toasted nut would be tasty, and give a bit of good crunch. I used a combination of skim milk and coconut milk, but if you are avoiding dairy I think that you could substitute almond milk for the skim milk and the results would be fantastic. I wouldn’t go for all coconut milk since it’s a bit heavy. In a saucepan, bring the rice, milk, and coconut milk to a simmer. Reduce the heat to medium low and add the pineapple, vanilla and salt. Cook, stirring occasionally, until most of the liquid has been absorbed. 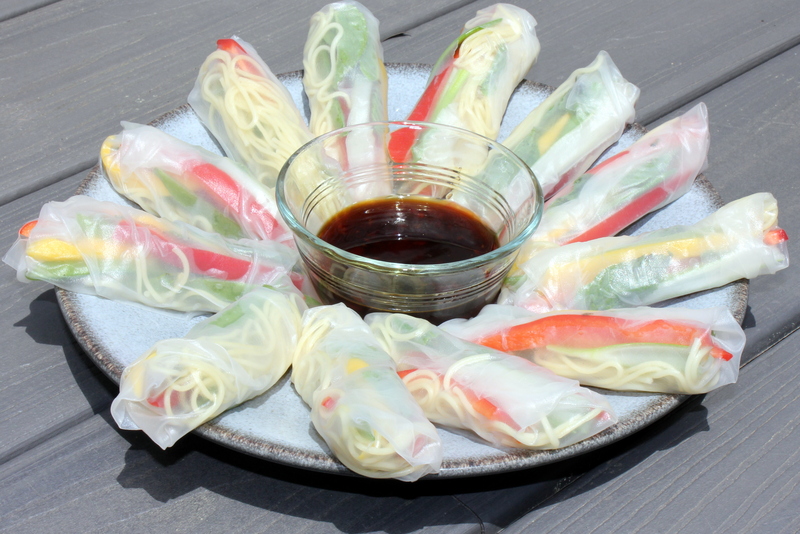 This will take anywhere from 15 to 45 minutes, depending on the type of rice and how long you have left it sitting in your fridge. 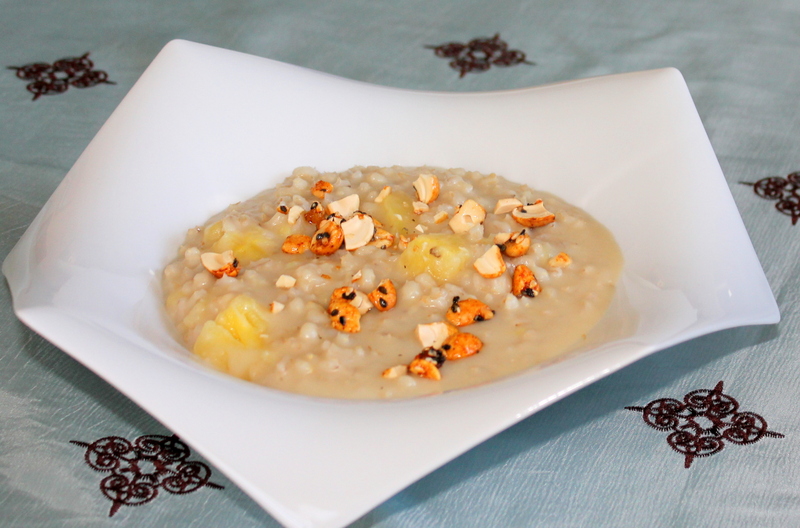 Serve warm topped with toasted chopped nuts or chill and serve cold topped with toasted chopped nuts. Jeff hates matzo. Not surprising, really, since there isn’t much to like about matzo. Dry and bland, matzo isn’t meant to be tasty. And yet, we do just about everything we can to make it palatable. Never mind that enjoying it really sort of defeats the purpose, we’re pretty determined to make matzo delicious. And frankly, with enough butter, sugar and chocolate, just about anything is delicious – even matzo. There are some clever things done with matzo this time of year. There’s matzo ball soup, of course. And matzo kugel. Matzo brie is a personal favorite, along with matzo pizza. Some more creative folks make matzo lasagna or matzo sliders or matzo granola. Pretty fancy stuff when you’re starting with a humble cracker, and pretty tasty too. But Jeff won’t touch any of it. All I have to do is mention matzo and he leaves the kitchen. 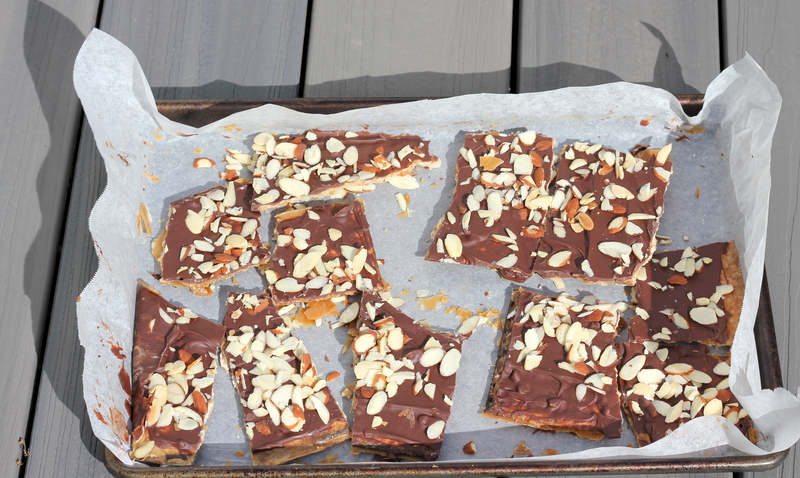 So when I set out to make a lovely batch of chocolate matzo toffee, Jeff turned up his nose. But the smell of bubbling butter and sugar and the sweet scent of melted chocolate piqued his curiosity. When I handed him a nice big chocolatey piece he took a tiny, tentative, reluctant bite. And then he smiled. 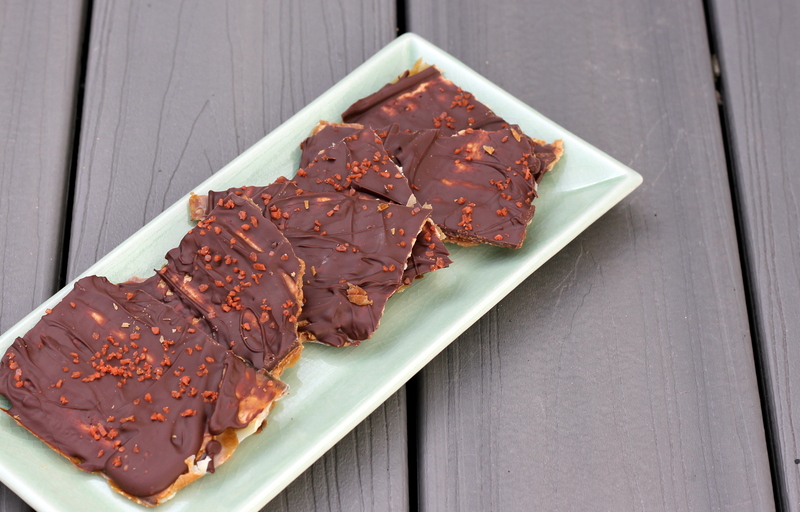 Yes, even Jeff, the ultimate matzo-hater, approves of chocolate matzo toffee. It’s that good. Sweet, buttery, and crunchy, it’s pretty much everything you could want in a treat. I topped half of my batch with toasted sliced almonds, and the other half with pretty pink Hawaiian salt. I happen to be partial to the combination of salt and chocolate, but you can feel free to use any toppings you like. Chopped dried fruit might be nice, or walnuts. But for the chocolate, I really do like to use the mini chocolate chips – they melt faster. Preheat the oven to 325 degrees. On a large rimmed baking sheet, arrange the matzo pieces, breaking as needed to fit. In a saucepan, melt the butter and brown sugar together. Pour the butter and sugar mixture evenly over the matzo. Bake until the brown sugar mixture bubbles and darkens slightly, about 10 minutes. Remove the matzo from the oven and sprinkle evenly with the chocolate chips. Allow the chocolate to melt, about 5 minutes, and then use a spatula to spread the melted chocolate evenly over the matzo. Sprinkle with the toppings, and allow to cool at room temperature for 10 minutes, then transfer to the refrigerator and chill until very firm, about 2 hours. 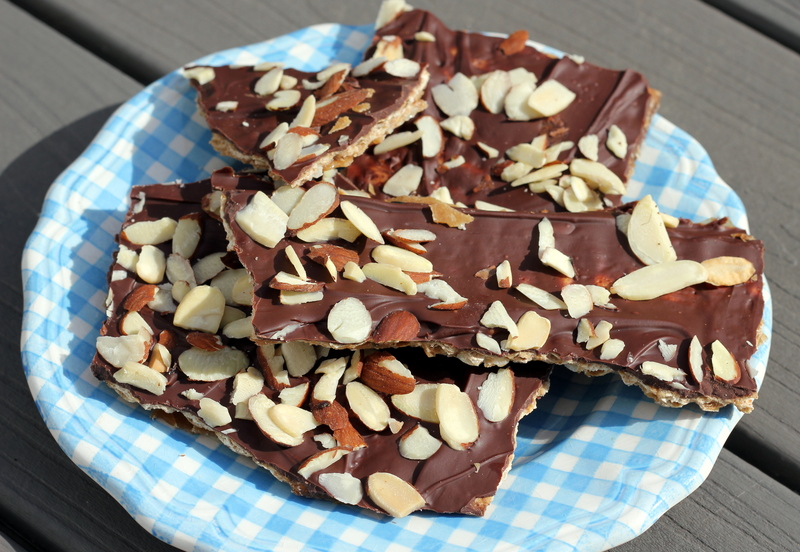 Once firm, break the chocolate matzo toffee into pieces and serve. 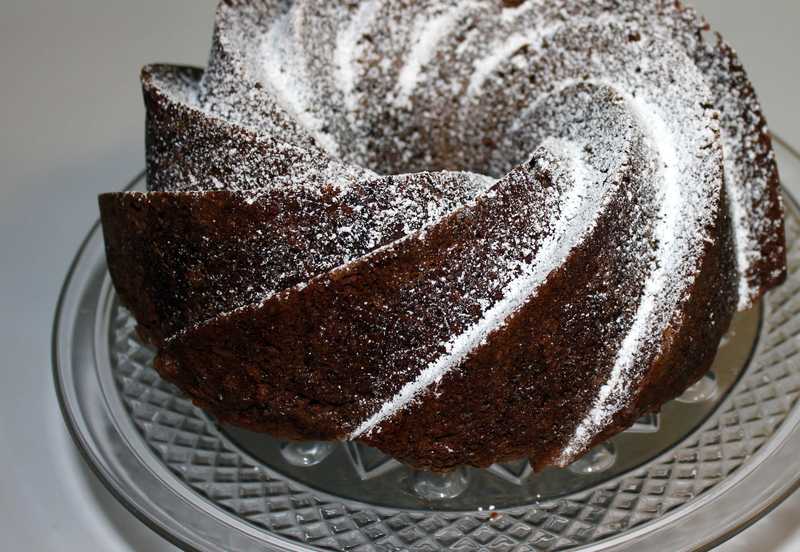 I’ve been sitting here, trying to think of a way to explain to you why I adore spice cake. I’ve come up with about 25 different adjectives, but the truth doesn’t have anything to do with flowery language. The truth is pretty darn simple. 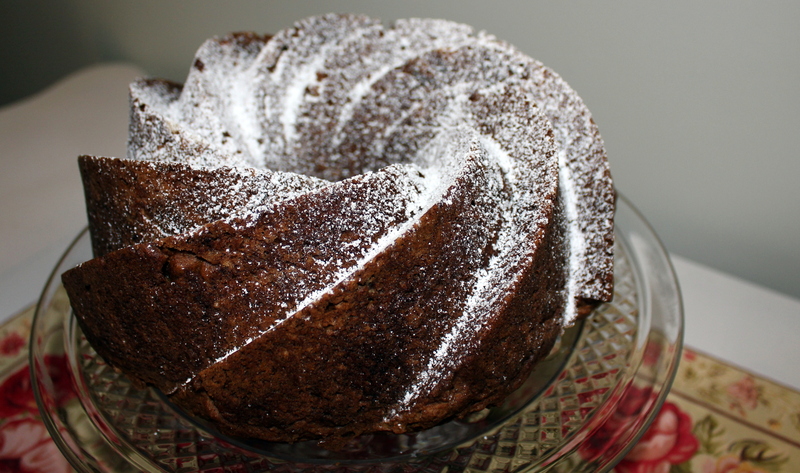 I love spice cake because I can get away with eating it for breakfast. Cake for breakfast. It’s my dream. Which is why I adore my grandmother’s sour cream coffee cake in muffin form – anything in a muffin tin qualifies as breakfast, right? As I mentioned back when I shared that coffee cake muffin recipe with you all, for many years my kitchen has been lacking a bundt cake pan. I have more bakeware than any woman should reasonably own. In fact, Jeff had to build me an extra set of shelves in the basement to hold my mini doughnut pan, my Madeleine pan, my candy molds, my petit-fours kit, my mini tart pans… you get the idea. But for some reason, I never got around to buying the basic bundt pan. I was at my aunt’s house for dinner a couple weeks ago, and after we were so thoroughly stuffed with brisket and potatoes we thought we would never eat again, she brought out two of the prettiest bundt cakes I had ever seen. Yes, two. She’s like that. At her table, I have never been served less than two desserts, and usually more. Her cakes were beautiful, with their pretty fluted edges. And after one taste, I realized that the shape was not just for show – all those ridges (all that extra surface area) make for plenty of extra buttery crisp bits. I love that buttery crisp cake edge! I oohed and ahhed over those cakes, bemoaning my lack of bundt pan, whining to my cousin even as I devoured a mega slice of each. And a week later, when UPS delivered a beautiful bundt cake pan to my door, I was baffled for only about two seconds. My cousin is so thoughtful – and had been so shocked that my over-stocked kitchen could be lacking such a necessary staple – that she turned to Amazon that very night. So I made spice cake. And I’m loving all those buttery crisp edges and intense flavors this morning with my cup of tea. This cake is wonderfully moist and lovely on its own, but also fantastic with some barely sweetened whipped cream. And if, like me, you save a slice for breakfast, a smear of cream cheese is pretty great too. Preheat the oven to 350 degrees. Grease a bundt pan. Stir together the flour, baking soda, cinnamon, salt, ginger, allspice, and nutmeg. In a separate bowl, beat the butter and brown sugar together until very fluffy. Add the eggs, one at a time and beat well. Then stir in half of the flour mixture, all of the applesauce, and then the remaining flour mixture. The batter will be a bit stiff. Spread it into the bundt pan and bake until a toothpick inserted in the center comes out clean, about 50 minutes. Cool before removing from the pan. Sometimes the washing machine breaks and floods the basement with sudsy water. Sometimes the heel of your favorite black leather ankle boot breaks off as you’re walking up the stairs to your office. Sometimes a jagged pebble on the interstate bounces up and cracks your windshield. Sometimes, all of these things happen on the same day. And at the end of a day like this, simple, unfussy food can feel so, so good. There was a time when the more exotic ingredients a recipe had, the more desperately I wanted to rush out and buy every single one. I would lock myself in the kitchen for hours, emerging triumphant, elaborate concoction in hand, anxiously awaiting oohs and ahhs. And every so often I still get the urge to flex some culinary muscle. 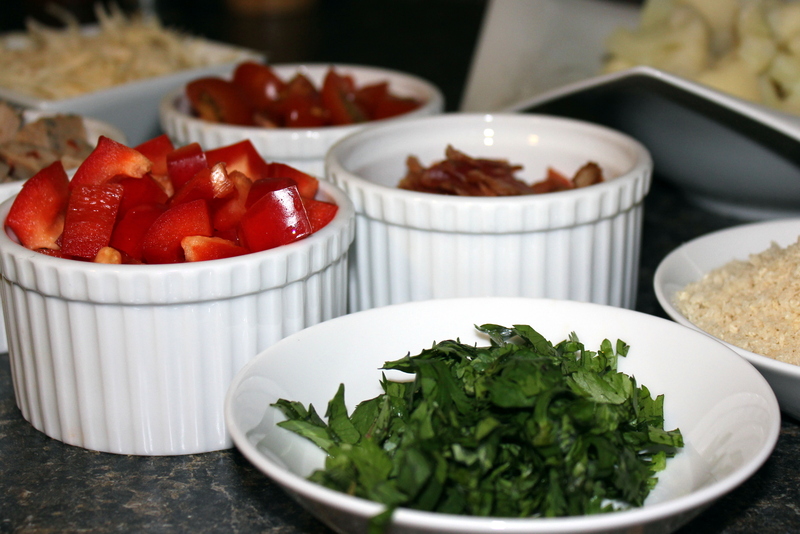 But these days, I fully appreciate the basic beauty of a quick, easy, tasty and healthy recipe. Quick. Easy. Heathy. It’s the holy grail of weeknight cooking. I used to think that simple was boring – a cop out. But the truth is that simple is elegant, sophisticated. Kind of like my favorite black leather ankle boots were before that six-inch heel bit the dust. The thing with simple food is that each ingredient matters. Good pasta, fresh celery, and the very best cheese you can find turn some simple pantry staples into a pretty delicious dinner. Assuming that, like me, you have a thing for cheese, you might even have all of the ingredients for this deceptively basic dish in your kitchen right now. And if you don’t, well, make this pasta once and I promise you’ll start keeping anchovy paste and wedges of parmesan on hand at all times. 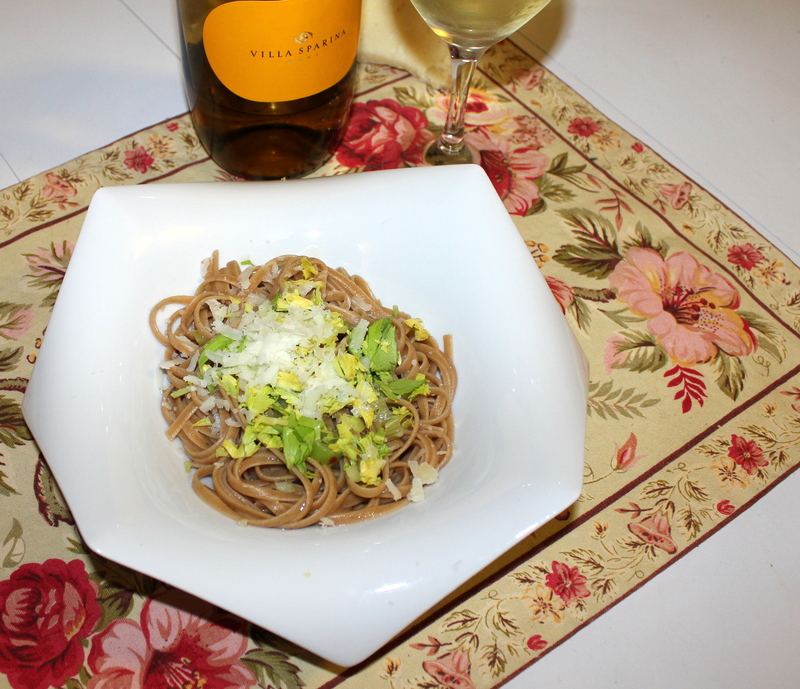 This pasta takes all of 10 minutes to make, is full of flavor, and is ultimately comforting. If you think you aren’t a fan of anchovies, I don’t blame you. Neither was I. Until I tried melting down anchovy paste in plenty of fruity olive oil. When cooked, the anchovy paste imparts a deep, rich, salty flavor to the pasta that is frankly addictive. And if Jeff, the consummate fish hater, asks for this pasta on a weekly basis, then there really has to be something to this anchovy business. As for the celery, well, I use it because it’s always in my fridge. Why do I buy celery every week? I honestly have no idea. But I do it. And I’m always looking for ways to use it up. Go figure. I suppose that you could elevate this dish by using a bit of sliced fennel and some fennel fronds instead. But the humble celery works just fine. It’s lovely, actually, and pretty underrated. The real star here, though, is the cheese. Which means you should spring for good cheese. And no, good cheese does not come in a shaky can. I’m not actually sure that stuff is cheese at all. What you want is a nice wedge of Parmigiano-Reggiano. And a good grater. In a large pot of boiling, well salted water, cook the pasta until just al dente. Be careful not to overcook. Meanwhile, in a very large skillet, heat the oil over medium heat. Saute the anchovy paste and garlic in the oil, stirring often, until the garlic starts to brown slightly. Add the celery, oregano and red pepper and continue to cook until the celery is soft, about 5 more minutes, and then reduce the heat to low. When the pasta is done, drain and reserve 2 cups of the pasta cooking liquid. Add the pasta to the skillet with the celery mixture, along with one cup of the pasta cooking liquid. Toss the pasta with the sauce, along with half of the cheese. Cook, stirring, for a couple more minutes, adding additional cooking water to loosen the sauce if needed. 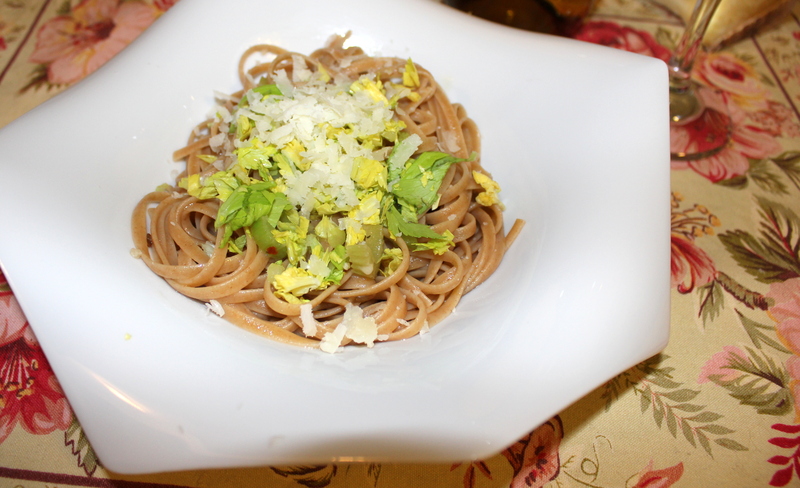 Serve the pasta in bowls, topped with the celery leaves and the remaining cheese. I’m going to say something controversial here, so brace yourselves. I don’t like that thick, gooey layer of melted Gruyère over top of a steamy bowl of onion soup gratinee. There. I said it. I know most people adore that bubbly cheese crust, but I think that molten cheese situation is unpleasant and chewy and simply too much. It overpowers the fabulous sweetness of the soup itself. The only thing worse than the dense cheese barrier between me and my soup is the underlying layer of soggy bread. Seriously, what could be appealing about soggy bread? 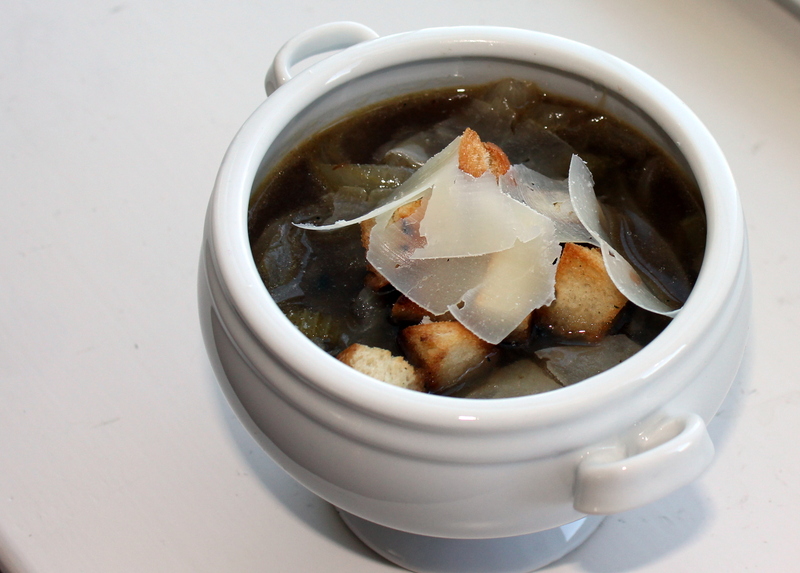 But I love French onion soup. The deeply flavorful salty-sweet broth and the silky onions are warm, comforting, and delicious. And while I am no fan of the usual soggy bread/cheese crust combination, a few shavings of cheese and a handful of crisp croutons are a welcome topping. I like to serve up the piping hot soup and then pass around bowls of homemade croutons and thin shavings of Swiss cheese. The idea is to add the croutons to your bowl in the very last moment, so they retain their crunch. As for the soup itself, the ingredients are simple. What you’re really dealing with here is some onions and some beef stock, so the quality of the beef stock is really key. Of course, as with most things, homemade is best. But I will admit that I rarely have homemade beef stock on hand (I do usually have homemade chicken stock, but that’s a whole different discussion). But beef stock in a can is pretty terrible stuff. It’s more or less just brown salty water. However, I’ve recently discovered that good local markets will often house-make and sell their own stock. 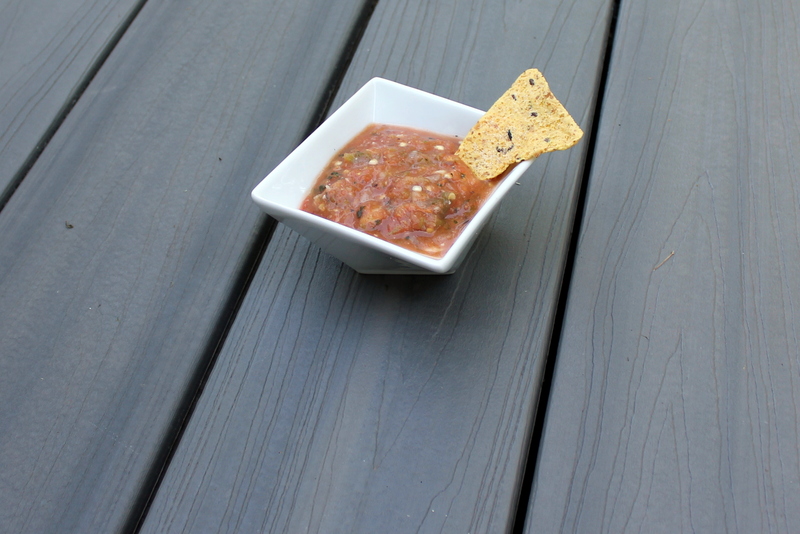 And if you can’t find the real deal, there are some decently flavorful store-bought options. In a pinch, I like Penzey’s soup base. This recipe freezes extremely well, so I usually make a double batch. Enjoy! In a large soup pot, over medium-low heat melt the butter in 2 tablespoons of olive oil. Add the onions and celery and cook, stirring every so often, until th onions are very soft and starting to brown. This should take about 30 minutes. Be patient! Add 1/2 teaspoon salt, pepper, and wine and stir well. Add the broth, and increase the heat to medium. Let the soup simmer for 30-45 minutes. Meanwhile, make the croutons. Preheat the oven to 400 degrees. Toss the bread with the remaining two teaspoons of oil, the remaining 1/4 teaspoon of salt, and the parsley. Spread the bread on a baking sheet in an even layer. Bake until the croutons are golden brown, about 8-10 minutes. To serve, ladle the soup into bowls. Top with the cheese and croutons.